I currently find myself in the throes of change, a period filled with stress, doubts, hope, excitement, and ultimately a need for relief. Yes, I am in the process of purchasing a new home that is just 6 miles down the road from my current abode. I have chosen to stay in Laurel, MD, as I find this township quaint with historic homes and accessible to both Washington DC and Baltimore. Furthermore, I have been mildly surprised by some real good eats located in this part of the suburbs which some may not expect to find in this rather quiet area. 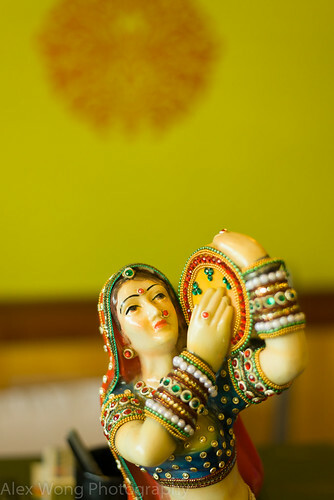 Recently, I have stumbled across one such Indian delight around the corner from me. 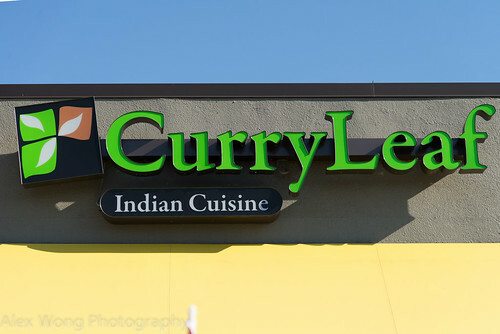 Curry Leaf has only been opened since the beginning of summer. It is located on busy Route 1, in a space once occupied by an all-you-can-eat Korean/Japanese restaurant that had a long stint in the area – I was getting slightly leery of its sushi offerings during its last few weeks. Not much has changed in the furniture setup but the space is warmer with some nature and spice colors along with some exotic prints on the wall, as well as the sushi bar that has taken on a transformation into a drink bar. Initially, I was quite leery of another Indian eatery in the neighborhood that has seen the demise of a couple of them. But a few visits to this new establishment has proven that it has injected an infusion of South Asia to the local eating scene. My visits were made during the lunch buffet and during dinner service. For dinner, my BFF insisted that we tried the Vegetable Samosa which I was not keen on, having tried many versions of these greasy dough balls that have proven to be lackluster on most occasions. But this version did pique my interest. The pastry here was crispy, thin and light, speckled with whole cumin seeds that added interest to the outer shell, perhaps baked judging by no trace of oil on the finger or the serving plate. The stuffing was a tasty mixture of mash potato and whole peas, made fragrant with whole curry leaves, bits of cumin and coriander, and spiked with a tinge of spice heat. 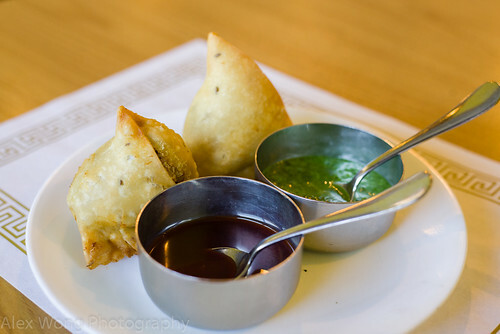 The accompanying sauces were the obligatory partners to these tasty bites: the tamarind sauce was tangy and slightly sweet with a faint hint of its clove-like aftertaste, and the coriander sauce was bright green, spicy and packed with the herbaceous coriander/cilantro, both tasting home-made and fresh. A fragrant and spicy start. For my buffet visit, I sampled the Vegetable Pakoras. 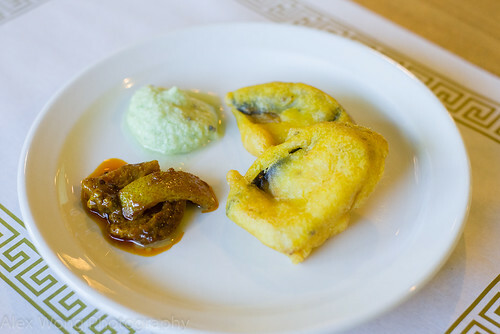 Pieces of zucchini, green pepper, and eggplant have been dipped in a yeasty dahl lentil batter and deep-fried, providing a more mealy dough made quite light with pockets of air from the fermentation, a far cry from the uninspired flour-water combination used by most establishments. But what really grabbed my attention were the delicate pieces of vegetable made puree-like by the frying and tasting vegetal sweet. The sides of lemon peel pickles and coconut chutney were well-made and worth sampling, tasting fresh and house-made. Another starter served on the buffet line were some traditional soups. Rasam was a light soup, tasting a bit sour from tamarind, and spiced with whole mustard seeds and curry leaves with a nice backthroat bite from the chili. However, it tasted a little bit insipid compared to other versions that I have sipped before. 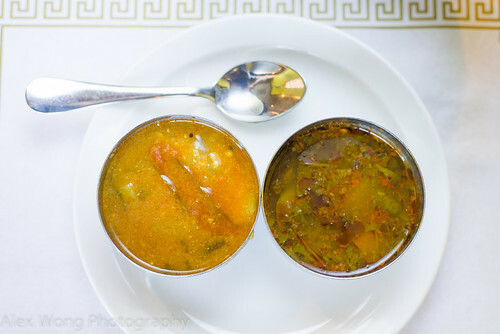 In contrast, the Sambar was more satisfying for me, a soup that carried a similar flavor profile as the above soup, but made more substantial by the addition of bits of squash, and made creamy by lentils pureed into the soup. If weren’t for the main courses coming up, I would have gulped down a couple more steel cups full of this hot liquid. On to the main courses. For my buffet visit, I decided to make a vegetarian/vegan plate. Spinach Kofta: The vegetable-ball consisted of slightly crunchy bits of carrots mixed with semolina-like starch coated with a creamy non-bitter spinach sauce that wowed me with its subtlety and a high level of satisfaction. Egg Curry: What I enjoyed about the dish was the light handedness in the spicing of the curry sauce that matched the mild egg whites yet creamy enough to pair with the yolk. Rajma Masala: Again, I appreciated the under spicing of this green bean and potato dish aided by a fairly subtle use of mustard seeds and cumin, enough to allow the green bean’s natural flavor shine through. Vegetable Korma: a medley of very tender peas, cauliflower, carrots and peas, brought together by cream and turmeric, with a hint of chili heat and fragrant spices. Aloo Beans: I marvelled at this simple yet savory dish with red beans cooked with the skin intact and starch cooked through with a hint of cinnamon wafting through each bite – who knew cinnamon worked with beans! Throughout my tasting of this plate, I kept going back to the spinach sauce which I couldn’t get enough of. The above dishes only reaffirmed my affinity for Indian vegetarian/vegan dishes that when prepared well, they are exciting and satisfying to the omnivore. On to the meat dishes. Goat Curry: the gamey pieces of goat were moist and tender coated by a delectable slightly sweet sauce hinting of dark spices and rich without the use of cream. Tandoori Chicken: the piece of red-stained meat was slightly firm on the outside encasing a moist and tender interior, made tasty from some proper marination with yogurt and spices, and it was far flung from my expectation of a flavorless piece of dried out meat which I usually encounter on some buffet lines. 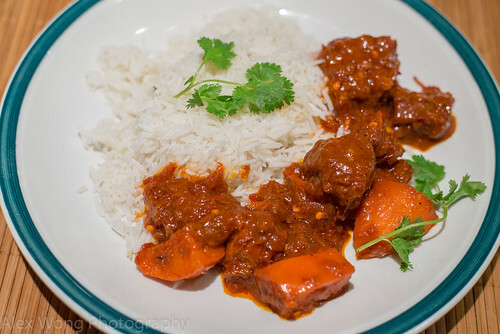 Butter Chicken (mislabeled Chicken Tikka Masala): The pieces were moist and tender, paired with a creamy buttery sauce that was slightly tangy and sweet that give me an impression that the dish was prepared with care rather than throwing the elements together. Vegetable Biryani (ok, I had to balance the meat pieces out): What I truly enjoyed about this “simple” dish is that the pieces of peas and green beans felt integrated with the rice spiced with cinnamon, cloves, star anise, and bay leaves, further brought together by a faint hint of butteriness from the use of ghee (clarified butter). This reminded of my BFF’s order of Shrimp Biryani one night that had a similar profile but richer with more sinfully good buttery rice coating the tender plump shrimp – I was amazed by this seafood dish tasting like a unified dish without any element feeling out-of-place. No wonder it is BFF’s favorite. Lamb Vindaloo was my dish on one night’s visit. Pieces of lamb were properly cooked to a very tender stage without falling apart and partnered with wedges of potato. But what brought the pieces of meat to another level is the sauce made fiery by dried chili evidenced by the chili seeds throughout the sauce. The chili heat was tempered with the use of fresh tomato cooked through leaving behind some of its skin. What was noticeable with this dish is that a skilful hand was behind the production of the balanced sauce, being not too salty, and the bare hint of oil. The accompanying Basmati rice was cooked to its perfect fluffy state with the random aroma-popping cumin seed running through the mound of grain. This dish, along with BFF’s Shrimp Biryani and Vegetable Samosa, made it an eventful night. 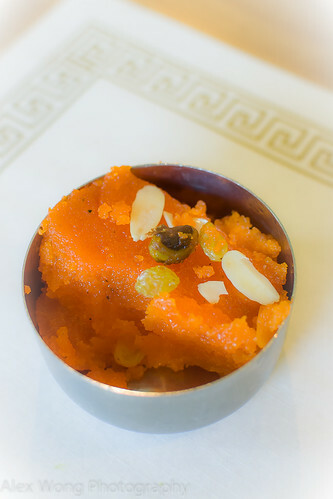 For my sweet craving, I helped myself to some Suji Halwa which was the only dessert offering on the buffet line. Initially, I thought that the pudding was too stiff when I cut into it along with the impression that there was too much of the pungent cardamom with the first spoonful. With subsequent mouthfuls, all the elements came together with the cream of wheat tasting slightly buttery, spicy from the cardamom, and sweet enough without being cloying. The pieces of ghee-soaked raisins (wow), pistachios and shards of almond slivers added interest to the sugar-laced starch. Somehow I made room for this sweet finale despite having ingested the above dishes. 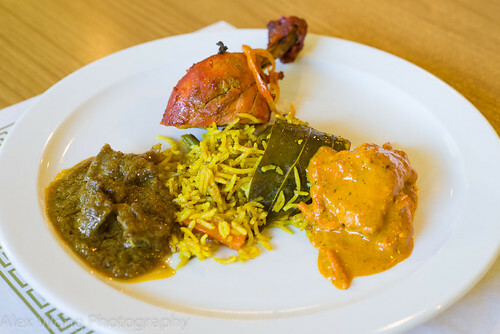 In a short period of time, Curry Leaf has already made its presence known in the Laurel area, judging by the filled tables (a noticeable South Asian crowd) during the lunch and dinner services, even despite a torrential rain one night. In my estimation, what stands out in their offerings are dishes that taste freshly made, a judicious hand with the spices and seasoning, and a skilful and knowledgeable kitchen staff that cares about the final product. 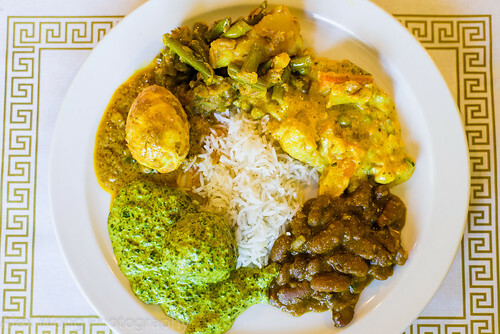 Yes, Indian cuisine can be tired-tasting and predictable. But I think I can count on this new establishment for something beyond the norm that is exciting and worth looking forward to. P.S. I just read that the chef comes from the defunct yet successful vegetarian restaurant, Udupi, which was my favorite for a long time. Now this explains the exceptional quality in the food.